Here’s our first cut of listings and ticket availability for New Year’s Day Friday 1 January 2016 in London which will cover Soho & The West End, Vauxhall, Clapham and East London and feature some of the city’s best known names Beyond, We Party and Horse Meat Disco. We also have early listings for Christmas and New Year’s Eve. Travelling to London for Christmas and New Year? Check out all you need to know from London Air Travel. New Year’s Day falls on a Friday next year, so we expect plenty of day and night events to be announced in the coming weeks. 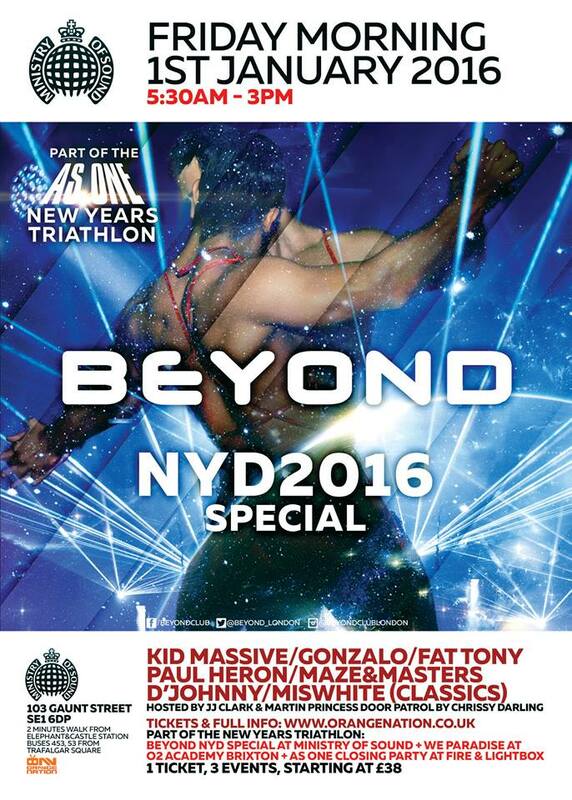 Beyond makes its New Year debut at The Ministry Of Sound (103 Gaunt Street, SE1 6DP) from 5am to 2pm. Early Bird tickets are on sale now. Joint tickets for Beyond, We Party and As One are also on sale. Update: Pictures courtesy of LondonClubland and nicophoto. Five years young and showing no signs of slowing down, We Party remains one of the biggest “go to” parties in London. After five years at The Coronet, We Party makes its debut at The O2 Academy in Brixton (211 Stockwell Road, SW9 9SL) on New Year’s Day. Three rooms (Rooms 2 and 3 hosted BeefMince and Heir) and the biggest production values We Party has ever seen are promised. £23.10 general admission and VIP tickets are on sale now. Joint tickets for Beyond, We Party and As One are also on sale. Update: Pictures courtesy of LondonClubland, Mark Storey Photography and nicophoto. Simon Le Vans, Andy Almighty and Moto Blanco host a 12 hour S.L.A.G.S. Chill-Out Anthem Reunion at the Royal Vauxhall Tavern (372 Kennington Lane, SE11 5HY) from 3pm with guest vocalist Belle. This will be a busy one. Advance purchase of tickets strongly recommended. 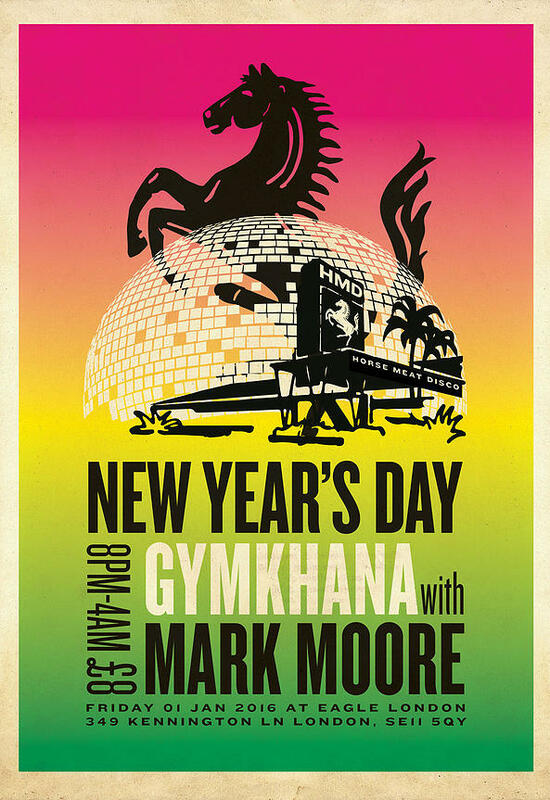 Horse Meat Disco’s New Year’s Day Gymkhana returns The Eagle (349 Kennington Lane, SE11 5QY) for 2016 with special guest Mark Moore. This will be extremely busy and arrival before doors open at 8pm is strongly recommended. 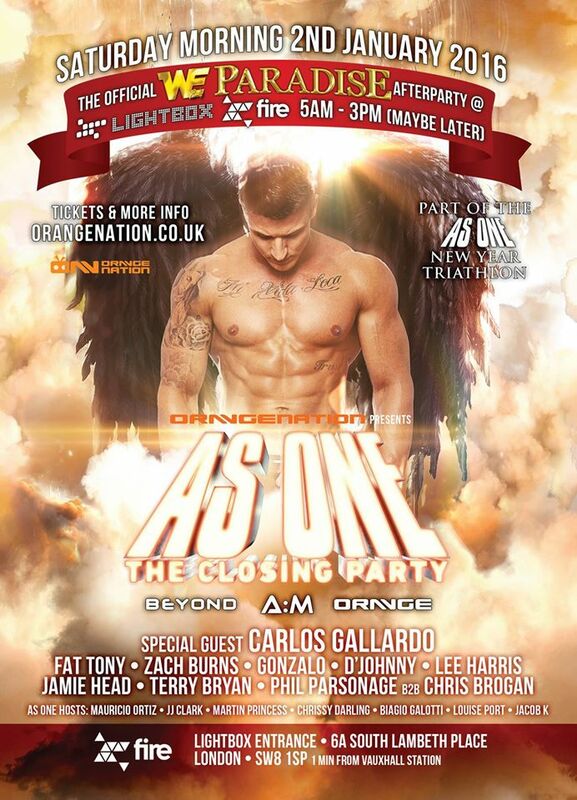 The “As One” multi-brand concept returns to Fire Vauxhall (39 Parry Street, SW8) from 5.30am Saturday 2 January. The line-up includes A:M and Orange and DJs Carlos Gallardo, Fat Tony, Zach Burns, Gonzalo, Lee Harris, Jamie Head, D’Johnny, and Phil Parsonage B2B with Chris Brogan. Joint tickets for Beyond, We Party and As One are also on sale. G-A-Y Bar (Old Compton Street) will be open for the entirety of New Year’s Day until midnight. G-A-Y Late will be open from 11pm to 3am. G-A-Y at Heaven will be open from 11pm to 4am. Should you be in the mood for an early January Retox Rupert Street Bar (50 Rupert Street) will be open from midday with a “January Sale” on selected drinks. Ku Bar (30 Lisle Street) will be open from 3pm to 3am. The Shadow Lounge (Brewer Street, W1F 0RF) will be open from 8pm to 3am. Brut holds a New year Bearnanza from 10pm Saturday 2 January (13-16 Allhallows Lane, EC4R 3UL). Advance tickets are on sale now. There’s no XXL event on New Year’s Day, but it returns to its normal slot on Saturday 2 January. We’ll update this page over the coming weeks with more events from more London venues. This entry was posted in London - City Wide and tagged Gay, London, New Year's Day. Bookmark the permalink.